Captain Scott’s expedition to the Antarctic set out from Roath Dock aboard the ship Terra Nova on June 15th 1910. The unusual choice of Cardiff as the departure point was due to the exceptional contribution of the City to the expedition’s preparations and financing, a relationship that also accounts for the presence of the Scott Memorial in Roath Park, as well as the present day café called Terra Nova at the western end of the Promenade. The close association between Cardiff and the expedition originated with Scott’s second-in-command Lt Edward Evans, whose Welsh connections secured support from the Western Mail editor W.E. Davies and other leading citizens in Cardiff, such as the ship owner and coal exporter Daniel Radcliffe. Davies is thought to have persuaded the Chancellor of the Exchequer David Lloyd George to contribute £20,000 to expedition funds on behalf of the government. The people of Cardiff gave some £2,500 (out of total national subscriptions of £14,000) towards the cost of the expedition, and a similar amount in supplies and equipment. In addition the City provided generous hospitality to members of the expedition in the days prior to departure, including a farewell dinner hosted by the Cardiff Chamber of Commerce and a reception at City Hall at the invitation of the Lord Mayor. When Terra Nova returned in June 1913 the ceremonies were of a more sombre nature, Scott and his four companions having lost their lives on their return journey from the South Pole. Terra Nova was restored to her former owner, Bowring Brothers of Liverpool, who agreed to give the ship’s figurehead to the City, at the request of the Parks Committee. 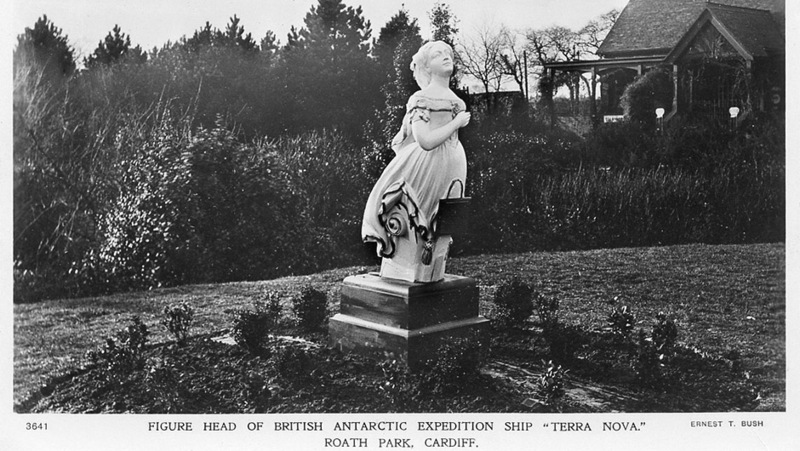 The figurehead was placed in Roath Park, on the southern side of the Promenade, where a formal presentation took place on December 8th 1913. Mr F.C. Bowring, in his presentation speech, announced that he wished to donate a clock tower as a permanent memorial to Scott and the 1910 British Antarctic Expedition. 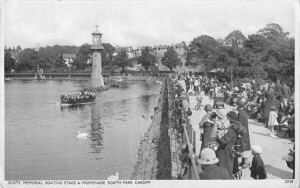 The proposed clock tower became the Scott Memorial, the lighthouse at the south end of Roath Park Lake. The Lake was emptied in 1914 in order to build foundations for the tower, which was completed during 1915. John Smith Clockmakers of Derby produced a clock for the tower. On October 14th 1918 it was officially presented to the City, again by Mr. F.C. Bowring. Captain R. F. Scott C.V.O. D.S.O. , R.N. Dr. E. A. Wilson and Petty Officer Edgar Evans R.N. lives in the Antarctic Regions. March 1912. “Britons all, and very gallant gentlemen”. F. C. Bowring Esq., J.P.
Anthony M Johnson, Scott of the Antarctic and Cardiff, 3rd rev ed Captain Scott Society, 1995.